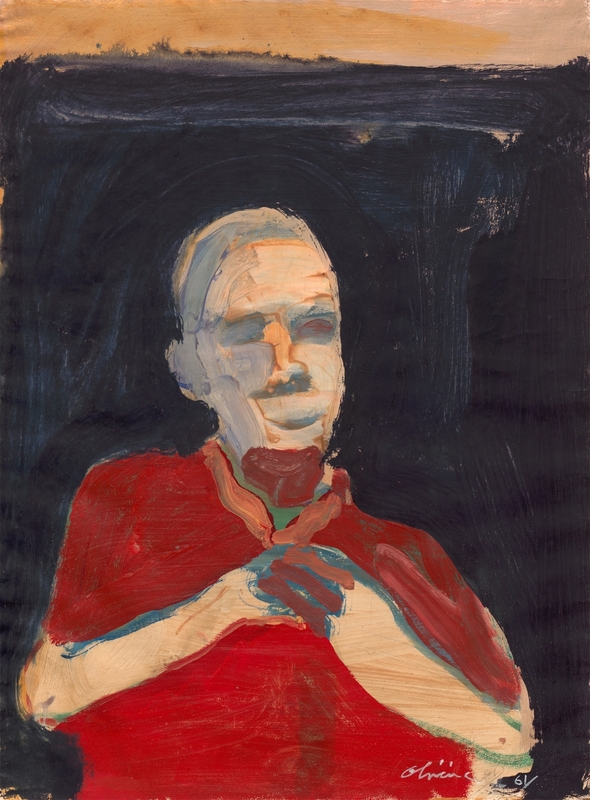 Although Nathan Oliveira's oeuvre is generally associated with Bay Area Figurative painting of the 1950s and 1960s, an existentialist expressionism informs much of his work, placing it apart from that of his peers such as Richard Diebenkorn and David Park. In 1950 Oliveira studied with Max Beckmann at Mills College, Oakland. This exposure to Northern European expressionism as practiced by Beckmann had a decisive impact on Oliveira’s work—as did attempts, in his words, to "make a spiritual contribution." Oliveira attended the California College of Arts in the early fifties. In 1956, Oliveira began teaching at CCA and also at the California School of Fine Arts (now the San Francisco Art Institute). He later moved to Stanford University in 1966 where he was a Professor Emeritus. He was the recipient of numerous grants and awards, including his election to the National Academy of Arts and Letters, a Guggenheim fellowship, as well as being the recipient of the Commander of the Order of Henry the Navigator, the highest civilian honor awarded by the Republic of Portugal, for contributions to Portuguese culture. Nathan Oliveira's work is held in many major museum collections including the Metropolitan Museum of Art, the Museum of Modern Art, the Whitney Museum of American Art, and the Guggenheim Museum, New York; the Tate Gallery, London; the Museum of Modern Art, San Francisco; the Smithsonian American Art Museum and the Hirshhorn Museum and Sculpture Garden, Washington, D.C.